As a certified fitness trainer and author, Joan Frentz’s life has come full circle. Diagnosed in her 20s with having arthritis, Joan suffered for years with discomfort and pain in her hands, feet, neck, spine, and the debilitating effects of severe bursitis in her hip joints. 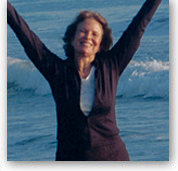 Now approaching 70, Joan credits exercise for enabling her to lead a physically active lifestyle free of pain. "Exercise, exercise, and exercise" slow and easy, never giving in to the discomfort, getting to know my body, becoming my own best advocate has made the difference. Best of all"I don’t hurt!" Since moving to California, and supposedly retired, she combined her earlier dance experience and knowledge of dance and exercise to create a physical fitness training program specifically designed for the “older” woman. Joan received her certificate as a personal trainer and taught at her neighborhood fitness center. Currently, besides writing and promoting her book, she personally trains women in their home and writes a popular general fitness column for a local weekly newspaper. Prior to California, Chicago and Louisville, Kentucky were home. Growing up in the Chicago suburbs provided exposure to athletics and training in modern dance and ballet. Her early Louisville years included involvement in the dance community, and Joan was the recipient of a National Endowment for the Arts Grant providing funding for dance and movement programs in the inner-city public schools. reducing the chances of injury. "